Ilias Layios was one of the leading Greek poets of his generation. 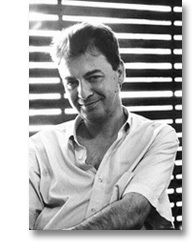 Born in Arta in 1958, he died tragically in Athens on 5 October 2005. He published his first book Πρόοδοιενπροόδω [Proodoi en proodo; In-progress progress] in 1981, followed by Ασκήσεις [Askiseis I-IX; Exercises I-IX] in 1984, under the nom de plume Alexis Fokas. In all, he published sixteen books of poetry, of which Περίζώου [Peri zhoou; On Animal] (1996), February 2001 (2002) and ΟάνθρωποςαπότηΓαλιλαία [O anthropos apo ti Galilaia; The Man from Galilee] (2004) were critically acclaimed. In the 1980s, he co-founded the short-lived but influential literary periodical Ωλήν [Holeen]. He earned his living as art curator, bookseller, and co-edited two poetry anthologies, Τριώδιο [Triodio] 1991, with Dionysis Kapsalis and Yiorgos Koropoulis, and Ανθοδέσμη [Anthodhesmee; Bouquet], 1993, with Michalis Ganas, Dionysis Kapsalis and Yiorgos Koropoulis. He edited works of poetry, fiction, pulp fiction and fantasy, wrote criticism for literary journals, including ‘Αναγνώσεις [Anagnoseis; Readings], the literary magazine of the left-wing Sunday newspaper Αυγή [Avgi; Dawn], and translated from Western and Eastern-European languages. Layios’ version of ‘Volta’ first appeared in the bilingual edition of Black Light (Μαυρο φως; Mavro Fos), co-translated with Nasos Vayenas (Lalon Ithor: Athens, 2005). For fuller commentary on Ilias Layios, see Maria Filippakopoulou’s essay ‘Foreign in our own country’ in this issue of ILQ.